By simply holding this forum, the administration has taken a step in the right direction to reassure students that the complaints of the students with disabilities, whose success at the University is being impeded by inaccessibility to many aspects of the University, are being heard. The University was quick to schedule a forum after President Liebowitz received a letter signed by 250 students and alumni concerned about the lack of accommodations for students with disabilities. Indeed, in her opening statement, Provost Lynch announced the addition of a significant number of handicapped parking spaces, a new handicapped elevator at Pearlman Hall, elevators and numerous upgrades for the Rosenstiel Basic Medical Sciences Research Center and, most importantly, a building condition assessment which will take into account of the accessibility of all of the University’s buildings. The Office of Diversity, Equity and Inclusion should also be commended for ensuring that the auditorily impaired could follow along with closed captioning during the forum. It is evident that in undertaking these tasks, the University wants to help students with disabilities. What is problematic, though, is not the idea of holding the forum — but the way the forum was conducted. It sought minimal input from the majority of students with disabilities and the Student Accessibility Service, the two biggest entities that would otherwise play the most active role in effectively addressing the needs of students with disabilities on campus. Much to the dismay of many students with disabilities who had otherwise planned to attend the meeting, many parts of campus — including major walkways near Usdan, where the forum was held — were covered in a thick blanket of snow and ice, rendering mobility difficult for all students, particularly those with disabilities. Navigating campus became even more difficult on Thursday, when large puddles forced students to seek roundabout routes around campus — including detouring through Upper Usdan. The first, basic step in addressing accessibility on campus might be a functioning drainage system. This board urges the University to hold another forum that will be more inclusive and give students another chance to provide their input. The forum itself was held in the form of a round-table discussion, where participants were directed to ask questions regarding Brandeis’ awareness of the current predicaments of many students with disabilities, and where the administration should direct its focus to most effectively address these concerns. While many meaningful discussions took place, administrators were not present at many tables to take note of these conversations. A commendable departure from this format was having several speakers with disabilities from numerous walks of the Brandeis community give powerful verbal testimonies of their experiences. This board agrees with many of the students, some of whom chose to speak at the meeting, that the forum should have been held in the form of a town hall. This way, attendees could have asked members of the administration their pressing questions directly as opposed to discussing them with others who ultimately have no say in how the University tackles this pressing issue. 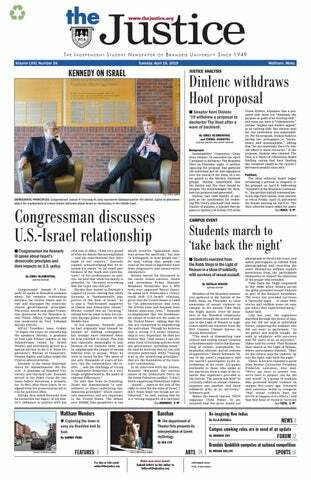 A town hall-style forum would have far more effectively addressed the pressing concerns of the student body, and would have helped the administration better understand the actual struggles of many Brandeis students with disabilities. With over 500 people in attendance and barely any of them afforded the opportunity to publicly provide input, the forum did little to understand the nuanced concerns of a great many students with disabilities. In fact, the configuration of the forum gave the unfortunate impression that the administration was deliberately trying to avoid any sort of public confrontation that could come about from a meeting with sensitive subject matter. While this board offers high praise to those brave enough to speak in front of the crowd and make their struggles public, the ability to directly address the administration would have likely been far more helpful for those whose needs have not been met by the University — and for administrators who need to better understand those needs.